Sunny Miami-Dade County is home to millions of Floridians and is the short-lived residence of beach-goers from all over the world. 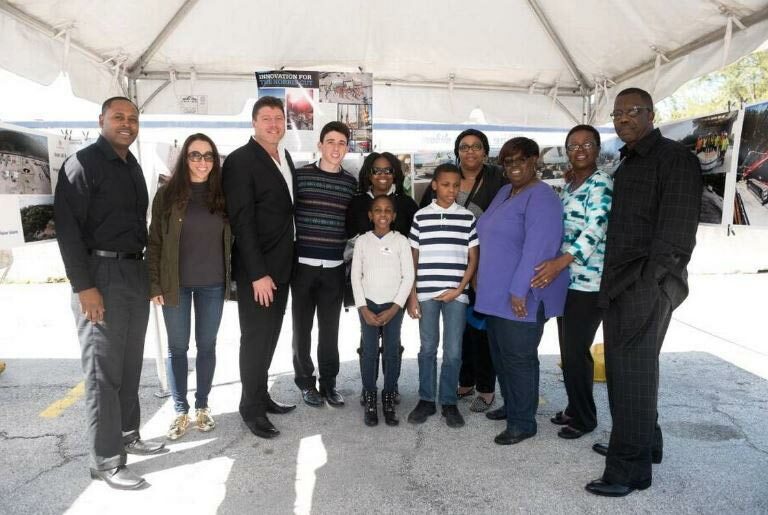 The seemingly non-stop flow of people to the region has made Miami-Dade Water and Sewer Department (MDWASD) one of the largest water and wastewater utilities in the United States. In an effort to maintain their high-level utility services, the Florida Department of Environmental Protection and local and state governments pledged resources towards a 10-year, multi-billion dollar initiative to upgrade the region’s outdated wastewater infrastructure. 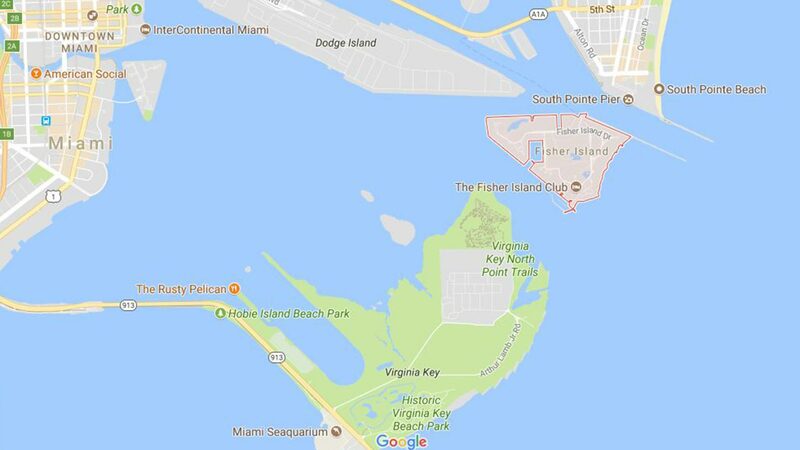 One of the wastewater pipelines in line for a revamp was located just south of the Port of Miami and runs underneath Biscayne Bay Norris Cut, connecting the Virginia Key Central Wastewater Treatment Plant (CDWWTP) to the exclusive residential area of Fisher Island. The outdated, 1977 system included a 54-inch diameter tunnel and force main. The new pipeline system is an upgrade with a larger 60-inch diameter tunnel and force main. Nicholson Construction Company operated as general contractor for the Norris Cut wastewater upgrade and was responsible for the design, permitting and construction. To assist with the tunneling phase of this project, Nicholson worked closely with tunnel design firm Arup, sister company and worldwide tunneling contractor Bessac and tunnel boring machine (TBM) manufacturer Herrenknecht AG. The region’s ground conditions were a concern to Nicholson engineers throughout the project. The geology underneath Biscayne Bay is made up of a hard limestone with frequent cavities ranging in size from 0.1 to 4 inches—not the ideal conditions for supporting the launch of a TBM. To avoid a cave in, Nicholson froze the ground at the mouth of the launch tunnel by inserting pipes into the rock wall. A salt water solution was then continuously pumped through the pipes, and over the next 7 to 8 weeks, the ground water within the wall froze making it easy to carve out a starting point for the TBM. 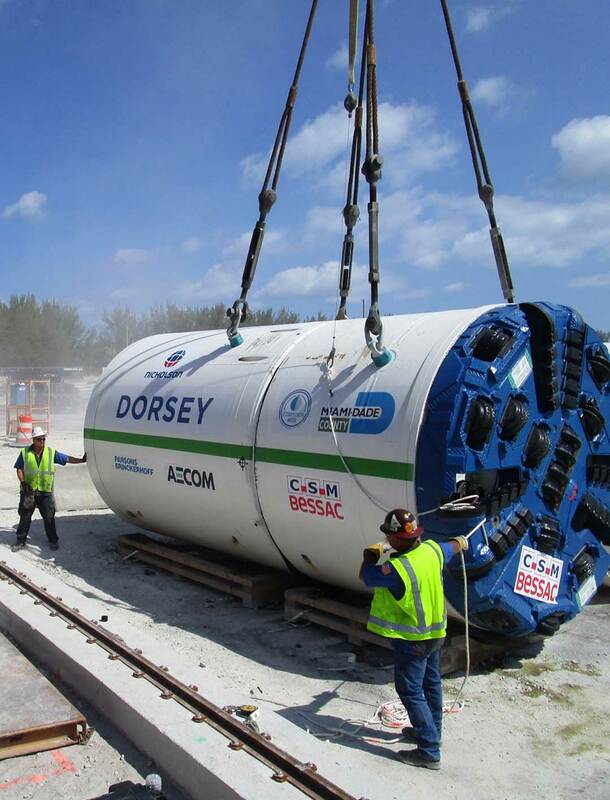 The TBM, nicknamed “Dorsey”, was launched from CDWWTP out of the secant pile shaft, and for 24 hours a day, five days a week—with a shift on Saturday—Dorsey dug its way towards Fisher Island. After the launch, Nicholson transported its equipment to Fisher Island to construct the soil mixing retrieval shaft. This shaft was built using 7-foot diameter soil mixed columns extending to depths of 87 feet and the middle was excavated in the dry. 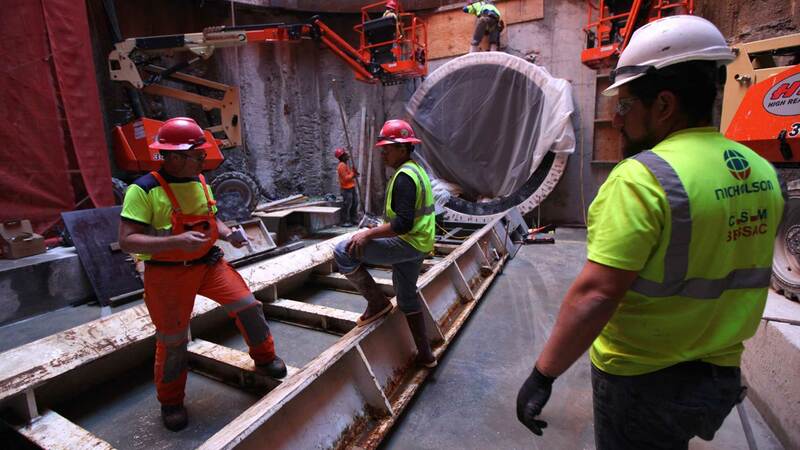 After 227 days and tunneling 5,280 feet, Dorsey reached its destination and pulled into in the 28-foot diameter soil mixing retrieval shaft. Miami-Dade County invited students at regional STEM schools to suggest a name for the TBM. Winner Jordan Feldman, a student at Maritime & Science Technology (MAST) Academy, proposed naming the TBM after D.A. Dorsey, Miami’s African-American black millionaire who originally owned Fisher Island. The new, updated wastewater pipeline system is fully functional and has an 80 year design life. 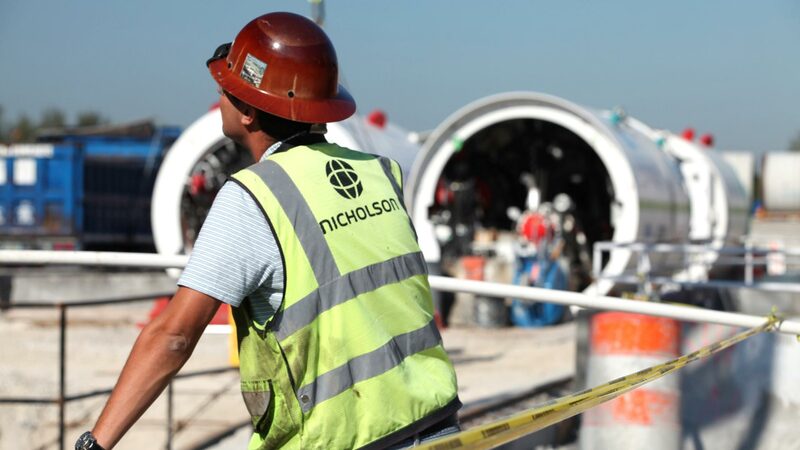 The successful execution of the Norris Cut Tunnel project is due largely to the collaborative relationship between the Miami-Dade Water and Sewage Department, Nicholson and the other contractors and subcontractors. Under Nicholson’s leadership, this design-build project is part of Florida’s push to further develop the state’s tunneling industry. 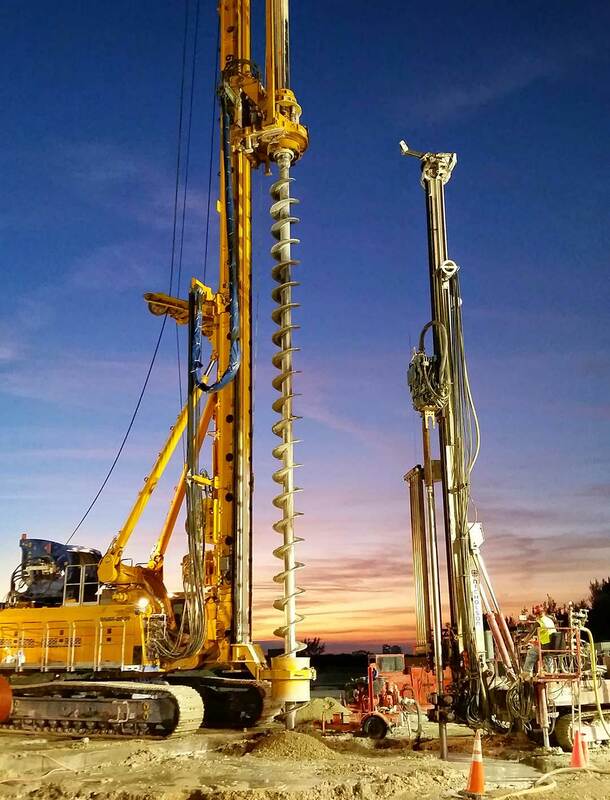 The successful completion of the Norris Cut project has helped to push the boundaries on what is possible when handling Florida’s challenging geology. The project won several awards, including the New Civil Engineer’s Tunneling Award for Design Innovation of the Year. Need to print? Download a PDF. Have a similar project? Contact us!